« My Kitchen BEFORE & AFTER ~ What a difference the lighting can make! With the holiday shopping season literally right around the corner, you may be running into that age-old problem of what to buy the person who has everything. I'll admit that I am constantly stumped at what to buy my parents each year, for I've been giving them presents many times a year for most of my life! Well, if you're also in the same boat and are looking for a whole slew of unique and unusual gift options for that hard-to-buy-for person on your holiday shopping list, then look no further than UncommonGoods. I recently had the chance to review the Pik a Fleur Vase. Keep reading to learn more! I reviewed the Pik a Fleur Vase from UncommonGoods, which retails for $48.00. When searching for that perfect gift this season, there are many classic options that always seem to be winners. For instance, wine gifts are always popular for most adults who enjoy a nice glass of vino. I was very pleased to find that UncommonGoods had a wide variety of gifts for wine lovers that were completely original and ingenious, such as the wine hourglasses. It took me a very long time to search through the endless selection of gift ideas at UncommonGoods, but in the end, I came across a product that I knew I wanted for myself...the Pik a Fleur Vase. One of the best parts of being a mom is how your children will constantly pick flowers for you when they're small. Riley does this almost daily and it never fails to warm my heart. Unfortunately, I never had a good way to display the treasures she would give me so that I could enjoy them around the clock. 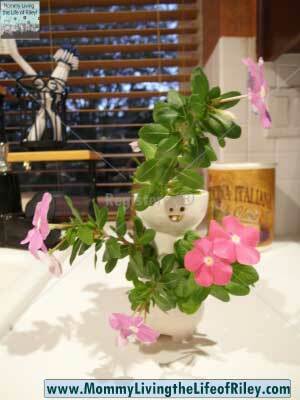 It's hard not to smile when looking at this charming little bud vase. Handmade of ceramic, the plain white exterior and grinning face give it a childlike simplicity, while the sunny orange glazed interior lets you know that it has a good heart. 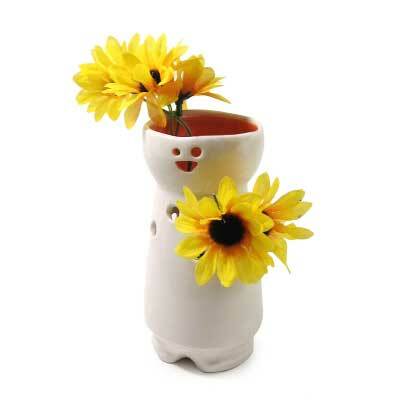 Insert flower stems through the holes in the container, and it looks as if his arms are full of a bouquet, for you or any friend who needs a cheerful pick-me-up. Holds 12-15 stems. As soon as the Pik a Fleur Vase arrived, my daughter rushed out to pick some beautiful flowers for it. We both loved its smiling little face and how it can hold those tiny stems that tiny fingers always seem to pick. The holes are located about halfway up the vase, so there's still plenty of room for this little guy to hold water. I have this bright and cheerful reminder of my daughter sitting right in a sunny spot on my windowsill and it never ceases to make me smile. If you are already racking your brain trying to think of some original gifts for Dad or gift ideas for Mom this holiday season, or if your husband and/or friends are next to impossible to shop for, then take a look at the unique wares from UncommonGoods. Picking the perfect gift that you know they don't already have couldn't be easier! Disclosure: I received the Pik a Fleur Vase from UncommonGoods in order to facilitate my review. No other compensation was received. This product review is based on my own personal experiences with this item and is completely honest and objective.